Look outside your window – you live in a special part of the world. There are all kinds of materials out there that are unique to where you live. 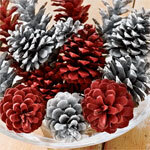 If you’re surrounded by pine trees, collect some pine cones and look for a unique way to decorate and display them. If you live in a desert, drape some Christmas lights over cactus or tumbleweeds. Using natural resources like this displays a sense of local pride, and is economical to boot. How much does it cost to go outside and collect some pine cones off the ground? Grab some fresh greenery from outside while you’re at it, especially evergreen, magnolia, or boxwood. These look great and provide a wonderful fresh scent in your home. Many Christmas tree lots either sell or give away fresh cuttings throughout the season, so give these a try as well. You can apply this strategy with local fruits and vegetables too – a decorative bowl full of fresh, local produce looks beautiful during the holidays. And don’t forget to make a nice meal of these afterwards! Don’t be afraid to mix in a vintage piece or two, as these can provide a charming decorative touch during the holidays. Thrift and second-hand stores are great for vintage items like ornaments, place mats, tins and candle holders. Show a little patience, and you’ll be rewarded with something unique for next to nothing. Further, many thrift stores donate a portion of their proceeds to people and programs in need, so you can feel good about your purchase. Ask about giving a donation if you’re feeling extra charitable. The key to a low cost, do-it-yourself decorating strategy is working as much as possible with what you already have. 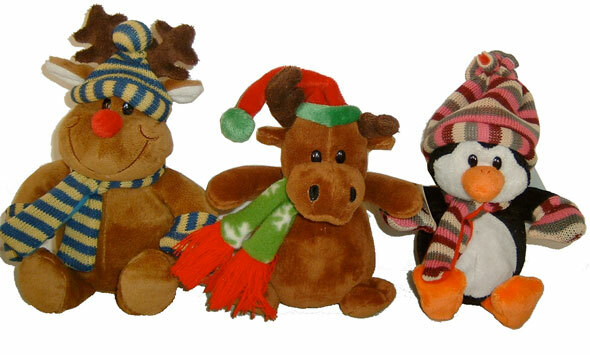 Take stuffed animals for instance: if you have a few lying around, dress them in scarves, hats, or other winter clothes. Try wrapping an empty box like a present for a teddy bear to hold. Stuffed animals and brightly colored toys and train sets are classic, festive touches around the Christmas tree. Speaking of toys, select a few and set them on a prominent windowsill for a magic touch. Alternatively, you can tie some small ones with a string or colored ribbon and hang them in front of a window for the same effect. Lighting is an important part of decorations, so it’s time to break out the candles. Set them in a hot towel for a minute or two, then roll the candles in metallic glitter. Display these in a group, and add a few natural elements like pine cones or greenery. When lit, the candles will create a sparkling show of brilliant light. Christmas tree ornaments are a natural do-it-yourself candidate, as most of us learned in elementary school. Here are a few simple ideas for making your own ornaments using common, inexpensive items. Early in the season, invite several friends over and ask everyone to bring any Christmas decorations they’ve grown tired of. Have some cocktails, bake some snacks – turn it into a nice pre-holiday party to get everyone in the mood. Exchanging decorations and ideas is a great way to get the creative juices flowing – you’ll come away with new color and texture ideas as well as new materials to execute them, all for free. Finally, plan for next year’s Christmas decorating right after this one ends. Few things in the retail world are ever as heavily discounted as Christmas decorations in January. Larger retail chains are on a tight merchandising schedule, and savvy shoppers know to shop after the holidays for discounts on seasonal goods. For even more savings, you can also find online coupons for Wal-Mart and other large retailers and department stores with a quick internet search.